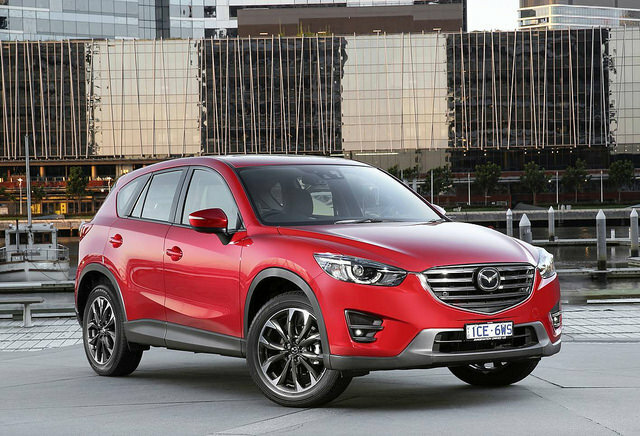 The Mazda CX-5 is a sporty crossover with excellent handling and great looks. The all-wheel drive model has one engine option: a 184 horsepower 2.5 liter four-cylinder. A six-speed automatic transmission delivers power to all the wheels. Plenty of cargo room is available in the CX-5, making road trips easy. The steering is tight and responsive and the suspension is finely tuned. Body roll is non-existent and the all-wheel drive makes cornering and harsh weather a non-issue. The interior is well designed, with high quality plastics giving an upscale feel. Two USB ports and an auxiliary jack are easily accessible in the center console. A 7 inch touch screen is used for the Mazda Connect infotainment system and can be controlled with steering wheel controls.